With only 30 days remaining in this year's short General Assembly session, I am pleased to report positive progress on several legislative goals. As I mentioned last week, the Republican agenda includes initiatives to support veterans and improve our system of higher education. These bills are continuing to move through the legislative process. During the past week, the House also heard legislation to reduce bureaucracy at the K-12 level. Following is information about bills that may be of interest to you. Did you know that there are more than 35,000 home schooled students in Virginia? In fact, when my children were young, I chose to educate them at home for several years. As such, I understand firsthand the need to select a curriculum that suits a child's individual needs and learning style. I also recognize that valuable life lessons are learned in extracurricular activities like high school sports. For this reason, I strongly support House Bill 1626, the "Tebow Bill." 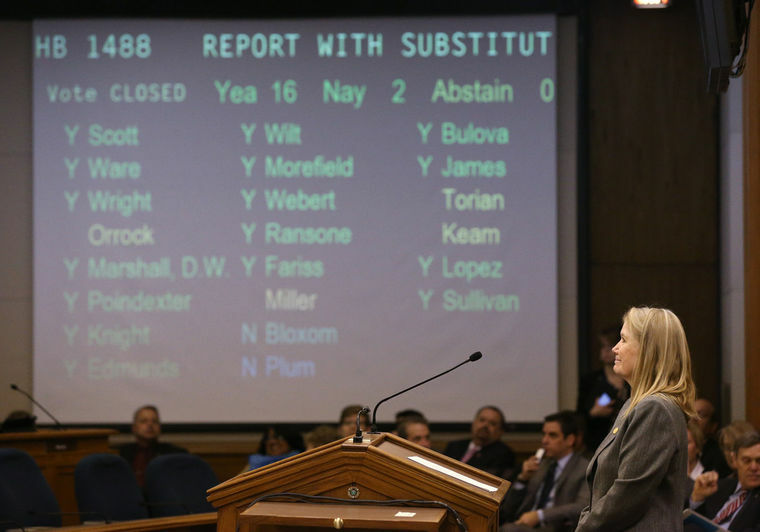 This legislation permits home educated students to participate in public school sports. Earlier this week, the bill passed the House of Delegates on a vote of 57-41. A common complaint from educators and parents alike is the bureaucracy that often characterizes our system of public education. To address this challenge, the House today passed House Bill 1674. This legislation will reduce the burden of annual accreditation by rewarding schools with a track record of success. Based on criteria established by the Board of Education, a school's accreditation status may be reviewed once every two years or once every three years, rather than having an annual review for every school. This change permits teachers and administrators to spend more time on student learning and give local leaders needed flexibility without sacrificing accountability in our schools. As vice chair of the House Education Committee, I hear frequent feedback and criticism about Virginia's Standards of Learning (SOL) assessments. This input helped shape House Bill 1490, legislation that expedites retake of SOL tests (with the exception of the writing SOL assessment) to all students regardless of grade level or course. Currently, expedited retake is only available for assessments that are required for high school graduation. Throughout the year, I hear from Virginians who desire increased governmental transparency and accountability. As a legislator, I take seriously this challenge. I recognize that government must adopt needed reforms in order to remain answerable to voters and taxpayers. For this reason, I introduced House Bill 1488. This commonsense legislation allows parties in a conservation easement to participate in a dispute mediation process overseen by the Virginia Land Conservation Foundation. Currently, parties in the easement must pursue litigation in order to resolve disagreements. My bill will add standards of transparency to the resolution process. To share brief background information, Virginia's conservation tax credit program is voluntary, allowing property owners to conserve their property through perpetual conservation easements. Landowners donate property, such as farmland or a historic parcel, to a qualifying public or private conservation organization. In return, the property owner receives a tax credit. Virginia's popular conservation tax credit program has facilitated the preservation of many historic and otherwise significant properties. Because taxpayer dollars help support this program, I believe that the process and program must be transparent. House Bill 1488 will provide much needed reform, and I am pleased that the bill passed out of the House Agriculture, Chesapeake and Natural Resources Committee with strong support. The bill is now on the House floor, where I expect it to pass on Monday. To view media coverage of this legislation, please read the following Richmond Times-Dispatch article: House panel backs bill to curb overreach by land trusts. Although the General Assembly is currently in Richmond, there are opportunities for political engagement at home. Yet another busy week in Richmond brought many visiting constituents. Listed below are a few of the organizations that were represented. If you are in Richmond, please stop by my office for a visit. To reach me by phone or email, please call 804-698-1096 or email DelBPogge@house.virginia.gov. Enjoy the weekend and have a safe Super Bowl Sunday!